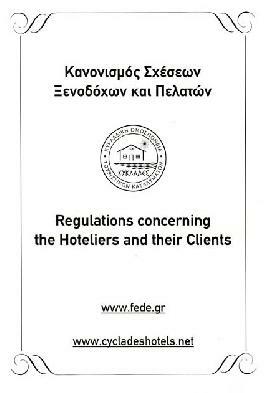 For all accommodation Rooms & Apartments is the following "Rules of Hoteliers and Customers Relations" and the decisions and directives of the ESOs and the Ministry of Tourism for respective obligations and rights in relationship with Travel Agencies and Tour Operators to issue specific operating regulations these. Kyronetai and has the force of law since it was published in the Government Gazette Decision 503007/1976 (Government Gazette 166) Secretary General of the Greek National Tourism Organization "Regulatory relations hoteliers and those clients," which is as follows: 1) Arith. 503007 Regulatory Relations hoteliers and those clients. O GENIKOS GPAMMATEAS TOY E.O.T. 1. Article 4 of the D / Tosh of 1 November 1938 "concerning qualifications Hoteliers and Hotel." 2. He A.N. 1565/1950 as ratified by N. 1624/1951 and supplemented by the ND 3430/1955, ND 4109/1960 and ND 201/1974. O hotelier is obliged to rent the empty rooms in each customer has and does provide all advertised amenities for the hotel (eg swimming pool, sports, night. Centre, omvreles, daybeds, sandy shore, etc.) . Prohibited the innkeeper to rent one part of the hotel rooms while the commitment was not to rent the remaining beds to other persons or Tour Operators or Travel Agencies (exclusively). O hotelier is obliged to respond in writing or by telegram within 3 days, or not to accept the booking of rooms have been sent to him in writing, by telephone or by telegram and, if so, may request an advance of up to 25% of the total price for night every day of residence ordered. H deposit should not be less than one day's rate. H reservation is considered complete upon receipt of payment adopted by the above, or with the written acceptance of the reservation by the hotelier. Whoever ordered the room to use for a predetermined period of time and then not use them for all or part of the period, he must compensate the hotelier half the price agreed for the period not used them. But if the customer warned hotelier than 21 days, he is exempt from the compensation and the hotelier is obliged to return the deposit received any. b) the common areas of the hotel for guests. If the customer require exclusive use omvrelas, couch etc, which may be obtained from the company, the hotelier is entitled to ask for specific payment based on a predetermined tariff. Tourist room or suite is allowed to be used only by the client hirer and persons that, when renting explicitly stated. H renting the room is considered to be made for one day, unless otherwise expressly agreed between the hotelier and the customer. H leasing is considered mutually renewed for each subsequent day, if the hotelier does not inform the client that the lease expires and the customer does not inform the hotelier that he will not hire. H This notice must be given by the previous day, otherwise it is the same day, but for the next. Where's leasing of the room, in the previous article, the client must vacate the room by 12 hours. Stay beyond time and up to 18 hours requires the customer to pay half the rent. Stay beyond the 18th hour, it requires the customer to pay the whole rent a day. If the client refuses, the Hotelier entitled to expel the room his luggage. a) accepting the room reserved by him or ordered through a third party, unless this is not in accordance with the order. b) To keep the room until the end of time agreed upon, otherwise it must pay the innkeeper compensation equal to half the rent of all other days, which corresponds to the agreed price overnight. Travel above applies if the customer does not arrive at the hotel on the specified date, except in cases of force majeure, which proved by irrefutable facts or evidence. H The agreement between the property manager and the client for the duration of the lease is valid provided relevant evidence. H day of arrival is on the whole rent, regardless of arrival time. H day of departure is not counted unless the client does not vacate the room by 12 hours the day of departure, in which case the provisions of Article 7 hereof. O hotelier must have rooms to customers who have accepted upon written order, telegraphic or contract - contract. otherwise be required to ensure their stay in another hotel of the same order and at least in this city, which has in any case the same amenities and residence conditions (sea sports etc) as advertised in his own hotel. In this case, the hotelier should pay the same transportation costs and additional difference in price between its own and the other hotel. If the above is not possible to guarantee the hotelier is obliged to compensate the customer for the entire price and stay for the entire period agreed upon, or he (the customer) have come to an agreement directly with the hotel or agency is bearer vouchers (VOUCHER) issued after Contract - Contract valid. Prohibited hotelier to contract for renting beds more than has his hotel. Violation of this provision will result in an administrative penalty against hotelier downgrade the hotel to the nearest classroom for one year. a) The price agreed for overnight bed and breakfast or half board or full board. 1) Travel matched mornings and meals (TAMPL NTOT) should be available at the price as determined in each case by the Market Inspection Police Orders. 2) Not all the hotels are not equipped with restaurants and canteens to sign contracts for bed and breakfast, half board or full board. 3) Similarly prohibited lease or sublease of restaurants and canteens that may operate within the hotel to persons other than the company, because it is clear here that the responsibility of business is the same for all departments of the Hotel Unique. b) The type of room (single, double, or bath. c) The precise duration of the lease. d) The number of overnights per month was agreed by upper and lower limit. 1) O hotelier is entitled to demand payment as a deposit up to 25% on the total amount resulting from the agreement made. 3) If the Tour Operator or Travel Agency does not meet the threshold of ALLOTMENT agreed for each month, the hotelier is entitled to the agreed compensation calculated nightly and amounting to half of the rest of the threshold ALLOTMENT remains uncovered. < br> H said compensation may be offset against any payment has been made. 1) Tour Operator or Travel Agency may cancel all or part of the agreed beds without having to pay damages, if proven alerted the hotelier twenty-one (21) days before the agreed arrival time (RELEASE PERIOD). 2) Respectively, the hotelier is entitled to be released timeout (RELEASE PERIOD) twenty-one (21) days before the fixed arrival time for those agreed beds no validated by booking VOUCHER or ROOMING LIST. 3) Travel Travel Agencies Travel Agencies or undertake mandatory, with the Convention ALLOTMENTS and void this contract, the obligation to pay a certain percentage of the agreed ALLOTMENTS at the waist (APPILIOS - MAIOS - OKTOBPIOS) season. Tourist rate is freely determined by month of the counterparties. If the Tour Operator or Travel Agency does not fulfill this obligation, the hotelier is entitled to in proportion to the percentage of ALLOTMENTS, which was not covered reduction of beds agreed for the high season (June -, July, - AYGOYSTOS and September). 4) Travel Travel Agencies Travel Agencies or undertake the contract of ALLOTMENTS and void this contract, the obligation to grant hoteliers in time explicitly specified in the agreement, binding status of bookings for the period 1 / 7 to 15/9. Similarly hoteliers are required to ensure the number of beds of the above list increased by 30% for the treatment of late bookings. H amended paragraph 3 and paragraph 4 was added 535813/27-9-79 have the decision of the Secretary General E.O.T. In each room there must be tagged certified by the Police, which appear in detail in the respective columns, the room, the relative increases and the total price that will result from their addition and moreover the price of breakfast and lunch accordance with the Market Inspection Police Provisions of that time certainly are provided so that customers have accurate information on the total amount required to pay for their stay in the hotel room. Hotel companies which have been granted by the EOT right or obligatory breakfast meal must add to the price of the room and even in full and the prices set by the Market Inspection Police Provisions every time and offer the composition provided by the above provisions Market Inspection Police said dishes. Travel hotels which provide the right to compulsory half pension should advise their clients on arrival and must display a nameplate in a conspicuous place in the reception room and the bedroom. The hotel industry in the country should charge throughout the year the prices reported in EOT and approved by him. The levying prices lower or higher than those reported in conjunction with the determined each time by the Ministerial Decisions on hotel prices. b) bring to the attention of the competent organs of the EOT books for review (MAIN COURANTE) the daily traffic and billing of clients and copies of bills issued to customers. Contracts not submitted for approval and control, as above, will be of no probative value for EOT, if you dispute between the parties. Offenders of the above rules will impose administrative penalties of up to revocation of the appointment of responsible N / Manager of the hotel, where the contracts were signed and the demotion of the Hotel Unique in class that correspond receivable values ​​the infringement (RD 27/4 - 14/5/1937 Art. 10). O Hotelier for customer service, is required to keep the hotel open for 24 hours a day, employing a receptionist during the day and nightporter during the night. Also required to have 24 hours to operate the call center of the hotel. Operators N / Managers appointed by decision of EOT, are required to ensure compliance with the present regulations and laws relating to hotels and other provisions. Violation of the above will bring both administrative sanctions against N / Manager and at the expense of the Corporation. Client accounts are usually collected every week. O hotelier but may request the settlement daily. Failure to timely payment of the account, the innkeeper may refuse to continue renting the room or bed to retain the departing customer's debtor of all objects that have eiskomistei or delivered to him by the client in accordance with the provisions Article 5 of ND 5205/1931. O client upon arrival at the hotel, must deliver to the hotel or to the Executive N / Manager of Hotel precious or valuable items and money which he carries with him a receipt. Otherwise the hotelier is not responsible for any loss. For other items brought into by the customer, hotelier exempt from any liability if the loss or damage is due to negligence of the customer or the persons accompanying him, visit him or are in his service. Also hotelier exempt from any liability if the damage, destruction or loss due to force majeure (earthquake, fire, etc.) or to its peculiar nature. In case of illness from infectious or contagious disease or insanity, death or suicide of a client within the hotel, the hotelier is entitled to compensation by the client or his beneficiaries for the costs or damages resulting from the incident. Tourist amount of compensation is determined by the Secretary of EOT O hotel guest is responsible for any injury or damage done to the hotel due to him or his guests or servants, or any other person that is responsible for the customer (breaking glassware, crockery, wash basins, damage to furniture, carpets, clothing, etc.). a) sign at the entrance of the hotel forms ordered by the authorities. b) To deliver the key to the porter's room when leaving the hotel. the hotelier is obliged in any case to have two keys for every room of his Hotel. c) To receive visitors in the halls of the hotel. Visits to the rooms is prohibited, unless a suite. a) H preparation in the hotel rooms of the customers food and beverages as well as the focus in them except for patients or those who have called ROOM SERVICE. b) H use by customers diesel engines, electrical appliances etc. c) H using electricity for other purposes than lighting and shaver. d) H washing linen in the rooms and other clothing. e) H placement in hotel corridors every kind of luggage. f) H moving furniture in the rooms and the holes into the walls for hanging pictures or other objects. g) H retention in the hotel pets of any kind, unless the hotel provides for this space. i) H music and songs and all kinds of gatherings, which may cause inconvenience to other clients. For any noise or disturbance of minors are responsible parents or guardians. j) H transfer and use outside the rooms linen towels and other clothing. O client should be courteous to hotel staff for any complaints against them refer to D / address, which is required to satisfy him as much as possible and legal. If the client violates the provisions of the present regulations, noise systematically bothering other customers and generally behaving inappropriately to them and the staff can be seen as undesirable and D / Hotel management is entitled to claim within 24 hours to left the hotel to vacate the room from his luggage. If attacked by an infectious disease his relatives or his friends and his attending physician should immediately advise the D / Hotel management, the relevant police station and the nearest Health Centre. In case of violation of the present regulations, the customer or the hotelier can, if necessary, contact the Tourist Police or the absence thereof, by other police authorities, which are obliged to give all lawful aid and to enforce the provisions of the present regulations. O Regulation and Customer Relations Hoteliers applicable to our decision 7778/31-3-1955 removed from the publication hereof. O rules may be amended by decision of the General Secretary of EOT, published in the Government Gazette.